Aera was excited to host the grandfather of social business and microfinance, Nobel Laureate Professor Muhammad Yunus, to New Zealand for the first time between 8-10 April. Professor Yunus pioneered the concept of microcredit when he founded the Grameen Bank in Bangladesh - earning him the Nobel Peace Prize in 2006. He met Aera Founder Derek Handley when he was recruited to be one of the founding leaders of The B Team, the global leadership initiative Derek co-founded with Richard Branson to catalyse better ways of doing business for people and planet. While in NZ, Professor Yunus engaged directly with policy makers, iwi, investors, educators and entrepreneurs actively seeking ways to use the engine of business to solve some of our country’s entrenched social challenges. Professor Yunus presented a public talk on 9 April hosted by the Christchurch Chapter of SingularityU in collaboration with Ākina Foundation, Ministry of Awesome, Ohu, XCHC, Te Pūtahi and Christchurch City Council. 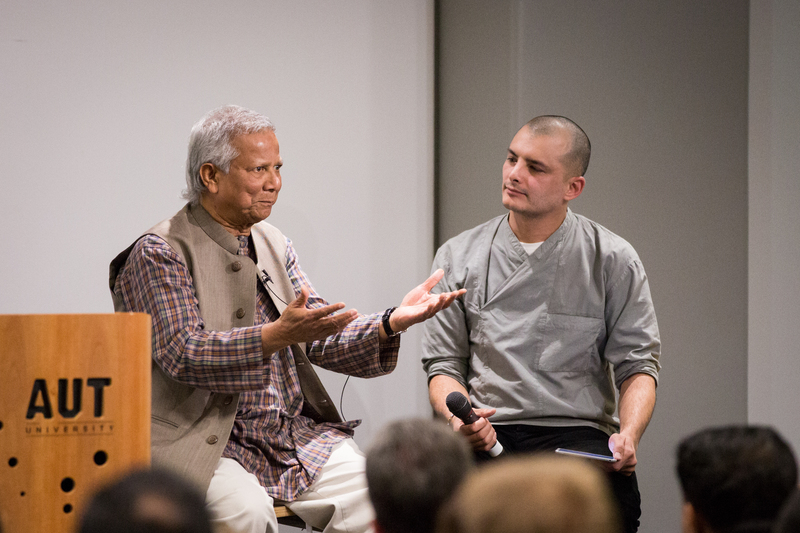 In Auckland, Professor Yunus spoke at a sold out event at Auckland University of Technology on 10 April. A panel on social innovation looked at the intersection of social business, impact investing and venture philanthropy in NZ and was followed by an intimate public dialogue with Professor Yunus that was facilitated by Derek Handley. • In Christchurch: Christchurch Chapter of SingularityU, Ākina Foundation, Ministry of Awesome, Ohu, XCHC, Te Pūtahi, and Christchurch City Council.